Objectives This study aimed to identify priority policy issues and health system research questions associated with recovery outcomes for burns survivors in India. Design Qualitative inquiry; data were collected through semistructured in-depth interviews and focus group discussions. Setting Nine sites in urban and rural settings across India, through primary, secondary and tertiary health facilities. Participants Healthcare providers, key informants, burns survivors and/or their carers. Results Participants acknowledged the challenges of burns care and recovery, and identified the need for prolonged rehabilitation. Challenges identified included poor communication between healthcare providers and survivors, limited rehabilitation services, difficulties with transportation to health facility and high cost associated with burns care. Burns survivors and healthcare providers identified the stigma attached with burns as the biggest challenge within the healthcare system, as well as in the community. Systems barriers (eg, limited infrastructure and human resources), lack of economic and social support, and poor understanding of recovery and rehabilitation were identified as major barriers to recovery. Conclusions Though further research is needed for addressing gaps in data, strengthening of health systems can enable providers to address issues such as developing/providing, protocols, capacity building, effective coordination between key organisations and referral networks. This research will inform the development of acceptable models of burns care from consumer, provider and health manger perspective. Participants from diverse backgrounds and a number of settings were involved in this research, providing a broad range of perspectives. Interviews and focus group discussions were undertaken in both Hindi and Marathi, with two levels of quality check performed to ensure high-quality translation. The outcomes of this study reflect the experiences and beliefs of the participants involved, potentially limiting generalisability. Burns contribute significantly to the global burden of death and disability, resulting in at least 265 000 deaths annually and are one of the leading causes of disability-adjusted life-years in low-and-middle-income countries (LMICs).1–3 Burns consistently rank among the top causes of morbidity and mortality globally; however. have never received sufficient attention in global or national policy initiatives as they do not neatly fit under any single Millennium Development Goal and are not captured in the Sustainable Developmental Goals.4 5 WHO has, therefore, described burns as the ‘forgotten global public health crisis’. The high burden of burns in India is known, and the challenges in prevention and care are recognised. However, there is poor understanding of the factors and interrelationships for planning effective measures for improving outcomes in burns survivors in India. The aim of this study was, therefore, to identify priority policy issues and health system research questions associated with recovery outcomes for burns survivors in India. Qualitative inquiry,14 consisting of interviews and focus group discussions (FGDs), was used to identify the needs of patients and carers within the burns healthcare context, as well as the experiences of healthcare providers and key informants, to develop acceptable approaches to address these needs in this setting. The rich diagram illustrates underlying mental models used during analysis. Rich diagrams (the precursor to Causal Loop Diagrams) are typically prototypes used to illustrate feedback and interactions among health system actors within a complex adaptive system.12 13 For this study, we present the initial identification and interpretation of the setting and interrelationship of factors that emerged in the context of burns care, influencing recovery outcomes in India. This study was carried out across nine different sites in India, between June and October 2016. The aim was to include all primary and important secondary stakeholders at the meso and micro levels. A range of settings including urban and rural, health facilities ranging from tertiary to primary healthcare centres, private, charitable and public facilities and state settings using social development index as the primary indicator were included. Participants in this study included healthcare providers, burns survivors, caregivers, neighbours/community, non-governmental organisations involved in rehabilitation, legal aid, workplaces and key personnel in health service implementation. Children were not included as participants; however, carers of child burn survivors were invited to participate. A purposive snowball sampling method was used whereby respondents were asked to suggest other potential stakeholders to be interviewed. This approach assisted with identifying and defining the boundaries of the network. Participant information is presented in tables 1 and 2, categorised as three main groups (patients and carers, healthcare providers, key informants). Prior consultation included in-depth interviews with healthcare providers only, and the key finding was the heterogeneity of healthcare services. The findings from the consultation helped identify key stakeholder groups and the breadth of healthcare settings. This paper presents the second round of data collection. We developed the interview and FGD guides based on a narrative synthesis of rehabilitation practices and recovery outcomes in burns survivors, and the initial stakeholder consultation. Before the interview or FGD, participants were provided standardised verbal and written information about the purpose of the research work, all data collection was face-to–face. For this study, semistructured in-depth interviews and FGDs at burns care services in India were undertaken to explore the participants’ own framework of meaning; for example, what a good outcome means to a health professional and the injured person. Written consent from participants was sought prior to each interview or FGD. The interviewer used the interview or FGD guide (online supplementary appendix 1) covering a range of social, economic, cultural, psychological and environmental factors influencing burns care. Beliefs about practices, perceptions of their benefits and harms, effects of these practices and decision-making processes in health facilities, families and communities related to burns care were also explored. The FGD was undertaken with nine burns survivors, caregivers and community workers. Participants were identified by the researchers in advance through patient support groups, healthcare providers and community workers. Participants were invited for discussion at a safe location in the community. Transcripts were imported into NVivo qualitative data analysis software V. 11 (QSR International, 2015). Content analysis was applied to the transcripts whereby overarching themes were initially developed, informed by the understandings of a systems thinking perspective. Thereafter, deductive thematic coding of the data was undertaken. NVivo was used to arrange the text according to codes and manage the codes in the interpretive phase. Through the qualitative data analysis, a rich diagram (figure 1) was developed using the software package Vensim PLE (Ventana Systems, 2015). For this study, the purpose of the diagram was to assist in the identification and interpretation of the context, components and outcomes that emerged in the context of burns care. System characteristics impacting recovery outcomes for burns in India. The interviews provided rich data, which described participant behaviour in relation to their service seeking, adherence to treatment and the broader sociocultural influencers throughout their burns care journey in the healthcare system. The aim of this study was to identify priority policy issues and health system research questions associated with recovery outcomes for burns survivors in India. To contextualise our findings, we first present a discussion of the findings and how this was used to inform the development of the rich diagram (figure 1). We integrate this research into the wider context of burns, policy and health systems in India. Finally, this section will present considerations and research questions that emerged from this research. This theme articulates with the quotes presented in table 3, theme 1, and figure 1 section on patient flow in the healthcare system. Participants from all three groups (patients and carers, healthcare providers, key informants) described the patient journey from the burns event through the healthcare system (figure 1—patient flow in the healthcare system). Limited resources were acknowledged but not seen as a major concern, with responsibilities shared between carers and health service providers. Time restraints and a shortage of health professionals willing to engage with burns care were raised. Participants, families and other carers were identified as playing an integral role as caregivers or attendees throughout the process of care. All groups raised the scope for their better inclusion in the care and rehabilitation process (table 2, theme 1). Patients and carers expressed they experienced a gap in communication with healthcare providers, with many reporting not having been provided sufficient information about the care needed, and thus the level/type of care that they were able to provide in turn. There appeared to be a disconnect in healthcare provider perceptions around what information they provide with regards to rehabilitation education and practices, and this was particularly evident for information around burns dressings, dietary needs and posthospital physiotherapy, as well as resultant issues such as contractures. Burns survivors and carers expressed frustration negotiating the complex, resource-intensive care system, with high out-of-pocket costs, access (transportation) issues and poor understanding of recovery. Patients and carers appear to trust healthcare providers; however, they also felt that they could not query healthcare providers around issues of care due to insufficient knowledge, indicating a potential cultural/education barrier. This suggests that there is scope for better processes around patient and carer education. One patient in particular suggested that people-centred care within the health system would be empowering (table 3, theme 1). This theme articulates with table 3, theme 2, and figure 1 section on patient flow in the healthcare system, and overall strengthening health systems. Stakeholder roles were varied, and the need for strong, cohesive multidisciplinary teams was well-recognised. Healthcare providers stressed that working in a multidisciplinary team is extremely important to the success of providing optimal care (table 3, theme 2). Healthcare providers often referred to burns care as a ‘not rewarding’ area to work in as recovery outcomes are often poor due to barriers, multiple levels of care and lack of multidisciplinary coordinated care. The key informants stressed the importance of legal and financial assistance, particularly for patients with burns who have experienced gender-based violence (table 3, theme 2). The findings integrate with work from Morgan et al,20 who emphasise that health systems are not gender neutral; gender being a key social stratifier affecting health system needs, experiences and outcomes. Gender influences how people interact dynamically in complex, multifaceted and context-specific ways, reflecting varying interests, values and power, and therefore is at the core of health and health systems research. This theme articulates with table 3, theme 3, and figure 1 sections on the patient flow in the healthcare system, strengthening health systems, as well as the gaps elicited. A major issue with hospital admissions process was patients moving between hospitals in the very early stages of their care (often taking days before proper care is received), as described by patients and their carers (table 3, theme 3). This intersects with known negative outcomes for recovery when adequate care is not received timeously. Difficulties with transportation to health facilities compounded this lack of access to healthcare in the acute phase of care. Satellite centres or community-based rehabilitation for follow-up of discharged patients were regarded as essential as patients often do not return to hospital due to issues around understanding the need, as well as cost and convenience. Large gaps in follow-up after discharge therefore exist (table 3, theme 3). This intersects with the gap in self-care after discharge. Education around the importance of continued care is regarded as important. The most significant barrier to care is the cost (and inconvenience) of commuting for rehab and follow-up care (table 3, theme 3). This theme articulates with table 3, theme 4, and the complete picture of the system depicted in figure 1. The need for primary prevention of burns emerged as a key policy challenge. Healthcare providers further raised issues around government support and understanding of the issues, and education/knowledge translation as key policy challenges (table 3, theme 4). For the key informants, issues around national priorities for burns, and the need for prioritisation of burns cases in the legal system were other key policy challenges (table 3, theme 4). Social challenges such as gender, lower social economic status, poor education and stigma were identified. Health systems challenges of limited resources, out-of-pocket expenses also exist. These participants stressed that government support is needed to achieve outcomes around these aspects. Broader systems challenge of interpersonal violence, navigating the judicial systems, vocational training were the challenges raised by a range of stakeholders. This may be especially pertinent for survivors of burns as a result of gender-based violence where their support network is in jeopardy. a knowledge gap, referring to limited knowledge on, for example, communication— health/administrative regulations. It is evident from this study that care and rehabilitation services for burns survivors in India do not exist in isolation; rather, they play an integral role within the healthcare continuum and therefore must be considered within the context of the overarching health system and cultural context. People’s behaviour and experiences in this healthcare system can be explained by social, economic, cultural, psychological and environmental factors, which impacts on service-seeking behaviour, adherence to treatment and the broader sociocultural influencers. Functioning of an effective health system can strengthen the capabilities of individuals and social groups, for example, by including people in identifying health priorities and planning services from individual care to community health interventions. People-centred health systems, in this way, reflect a progressive shift that has moved thinking beyond building-blocks models of health systems towards ones that centralise a human and relational nature. These approaches can also generate preferential gains for socially disadvantaged groups, either by impacting on the structural factors that disadvantage them (women’s autonomy) or by strengthening their ability to claim health resources or implement health action. However, in practice, severe bottlenecks in accessing government healthcare services compel households to seek private care, often resulting in high out-of-pocket payments. Significant inequalities with respect to healthcare access and health outcomes exist between states, rural and urban areas, socioeconomic groups, castes and genders. Past decades have seen several initiatives targeted at improving primary healthcare systems; however, the focus has been on infectious conditions and maternal and child health. Systems thinking approaches12 13 provide guidance on where to collect more data, or to raise new questions, hypotheses, obtain buy-in from key stakeholders and develop interventions that are pragmatic. A frustration for health planners and researchers has been the aspiration that interventions shown to be effective in a research setting cannot be simply replicated at large scale or to reach populations that are most vulnerable. Therefore, this research was conceptualised with the aim of eliciting a range of priority policy considerations and future research questions from a local, setting-specific and contextualised perspective. These are presented in box 1. Scoping burns registry to document burden and improve pathways for care for better recovery outcomes. How can health-related quality of life for burns survivors in India (low-and-middle-income countries) best be understood and meaningfully captured? How can the outcomes for burns survivors be improved as they move through the health system? How can we evaluate the financial impact/financial disability among survivors of burn injury? Need for development of best practice guidelines which include rehabilitation prescription facilitating continuum of care for improved recovery outcomes. How can communication about patient care throughout their flow through the healthcare system and into community- and/or self-care be enhanced? What are the best options for improved knowledge translation? Is there scope for mobile or digital health technologies to improve patient care throughout the healthcare system? What technologies exist? How can these be harnessed? Can (or should) task shifting to caregivers and family carers be formally included in a person-centred healthcare system? If so, how is this best achieved? What can be the pathways, family-centred care or by enabling community health worker? Adopting policy changes on health insurance and universal health coverage to address these challenges. 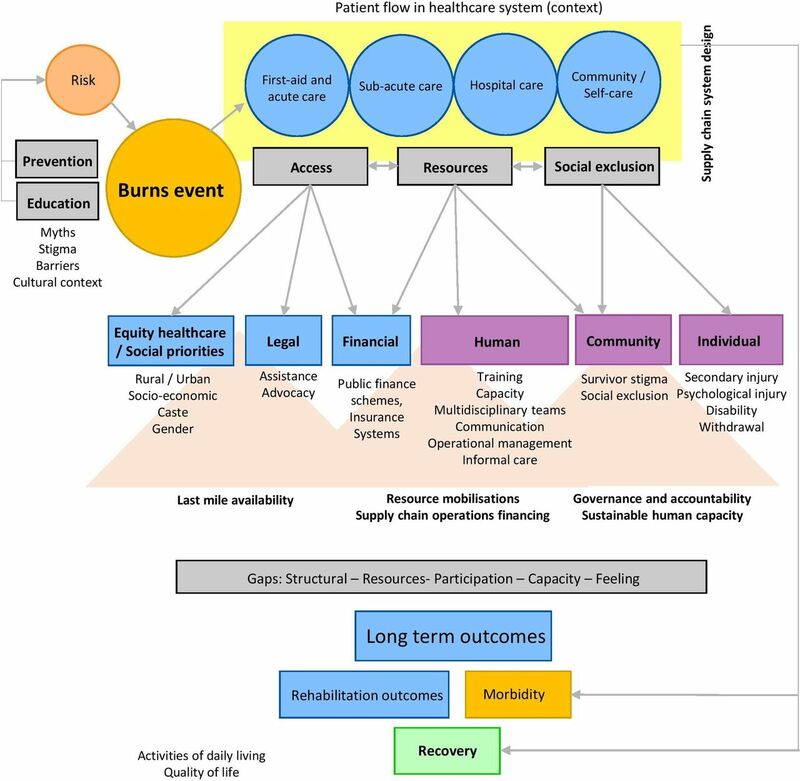 Develop a systems framework for burn care and prevention using the WHO system building blocks incorporating systems organisation, networks, dynamics and knowledge. What is the current state of legal and financial support available for burns survivors? How is this communicated and administered? What steps can be taken to improve this process, particularly in the context of culturally sensitive issues around burns survivors such as gender-based violence? Qualitative inquiry is time and context dependent. Therefore, this study is bound by the experiences and beliefs of these participants alone, but does resonate with what is known about the larger context. Furthermore, it was not possible to elicit relationships between the themes and the specific outcomes, although this is clearly an important area for further research. As the aim of this study was to provide considerations for future research, the method was appropriate to eliciting rich information in this regard. Limitations around conducting research in an LMIC setting, including cultural and language barriers, are also acknowledged, and the research approach aimed to minimise this. As reported, interviews and FGDs were undertaken in Hindi and Marathi, and were jointly translated and transcribed by the interviewing researcher and the translator, and a member of the research team checked the translated transcripts with the Hindi and Marathi transcripts. The ‘invisible face of burns’ is a critical public health problem in India.21 A goal of this study was to feed into the future development of pathways of care for burns survivors using a systems thinking approach12 13 in a realist context.22 This research will enable development of acceptable models of healthcare that can then be developed and piloted in the next stage of the research process. Better understanding how and where to potentially influence optimal long-term recovery outcomes, including a return to activities of daily life and quality of life, through considerations of opportunities and gaps is a key contribution of this research. World Health Organisation. Burns factsheet. 2016 http://www.who.int/mediacentre/factsheets/fs365/en/ (accessed 26 Jun 2017). In: Mock C , Peck M , Peden M , Krug E , et al ; eds. A WHO plan for burn prevention and care. Geneva: World Health Organization, 2008.
. Total burn care: Elsevier Health Sciences, 2007.
. Research Design: Qualitative, Quantitative, and Mixed Methods Approaches. 3rd edn. Thousand Oaks: Sage, 2009.
. An introduction to scientific realist evaluation. London: Sage, 1997. Contributors JJ and RI conceived the study and its design. JJ led data collection and data analysis. SB contributed to data analysis. SC and TP contributed to study design and assisted with study site identification and the recruitment of participants. All authors were involved in the interpretation of findings and approve this final version of the manuscript. JJ and SB drafted the manuscript. Funding This work was funded by WHO;Geneva reference number WCCPRD3608471 2015/572126. Ethics approval The University of Sydney Human Research Ethics Committee approved this study, with governance approvals as needed for sites. Data sharing statement The data collected and analysed through the current study are available from the corresponding author on reasonable request.